Strecker (1900) listed a wingspan of .75 inch. Head: Head and thorax dark purplish brown. Antenna: Simple, reaches to about mid-wing. Thorax: Head and thorax dark purplish brown. Forewings: Dark brown, purplish sheen. Jagged black line near base (a.m. line). No orbicular spot. Cream arc in reniform spot. A cream and black jagged intermittent line through middle of wing (median line), dips around the reniform spot. Another faint cream and black jagged line just below the mid line (p.m. line). Main ID 5 white dashes on outside edge (costa) from median line to tip. Wing tip (terminal line) dark scalloped line, may have white scale mixed in. Fringe same color as wing background. Note: white scales more numerous on older moths. Hindwings: Smoky gray to brownish with faint sub-marginal line and a discal spot. Legs: Brownish, feet white striped. Long spur on middle shin (tibiae). Abdomen: Abdomen lighter brown than head and thorax. Male has a black tuft on top side at the base of the abdomen. Moth Photographers Group - large map with some distribution data. 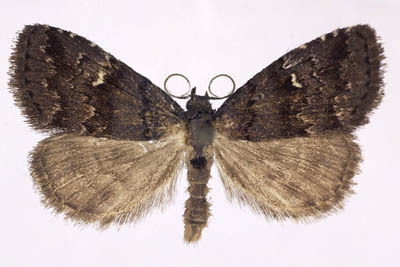 Holotype as Epizeuxis nigellus by Strecker, 1900. Locality: Illinois. In Strecker Collection at the American Museum of Natural History, Manhattan, New York. Idia species could be confusing. Similar Species: Smoky Idia Idia scobialis almost identical, but lacks the 5 yellow marks along the lower half of outer edge of forewing. Dyar, H.G., 1908. Notes on a few cases of synonymy in Lepidoptera. Proceedings of the Entomological Society of Washington. p. 31. Strecker, H., 1900. Lepidoptera, Rhopaloceres, and Heteroceres. Supplement 3: 36. 2. Lepidoptera: Noctuoidea: Erebidae of Great Smoky Mountains National Park, USA. Michael G. Pogue. 2012. Zootaxa 3153: 1–31 .